Yummy, Low Calorie Diet Food -- Plus Where to Buy! : Get Your Chocolate Fix – for Just 60 Calories! Get Your Chocolate Fix – for Just 60 Calories! One of the biggest drawbacks for a lot of folks when it comes to sticking to a diet is avoiding chocolate. But why avoid it when you can incorporate delicious low calorie chocolate treats into your dieting plan? Chuao (pronounced as chew-wow) Chocolatier is a maker of fine chocolate, and they are quickly becoming known for providing dieters around the world with a chocolate fix in the form of the Choco-Pod. I really like Choco-Pods. They are shaped like a cacao pod (the source of the beans that are used to make chocolate) and are filled with your favorite fruit flavors, including strawberry and balsamic caramel (this is my favorite), passion fruit caramel, banana brown sugar caramel, spicy cabernet caramel, and spicy macadamia praline. I stumbled upon these at my local Whole Foods store and thought what the heck. Sixty calories and get my chocolate fix too, you can’t beat that! So a new relationship was formed. And now, I've seen them popping up at other places, like my local coffee shop. So, keep your eye out if you don't have a Whole Foods. The chocolate in Choco-Pods are made using Venezuelan chocolate and contain sixty percent cacao. In addition to the caramel flavor (I love anything low calorie caramel), I particularly like the passion fruit for its spicy yet sour flavor that blends so well with the chocolate. I am also fond of the banana brown sugar caramel – it is possibly the sweetest of them all and has the flavor of a ripe banana blended with a burnt sugar flavor that makes it exotic and unexpected.Yum! I like the original solid Choco-Pod, too. It is available in two chocolate flavors – spicy Maya (named for the first culture that actually worshipped chocolate) which is flavored with ancient spices like cinnamon, cayenne pepper and Pasilla chile – and nutmeg, which has a subtle flavor of cardamom and nutmeg. Each Choco-Pod is wrapped in an individual wrapper (in boxes of 12) so that you can take one with you, without having to risk eating more than one portion. They are just one weight watchers (WW) point each! 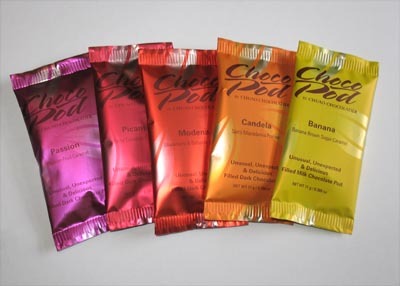 the Choco-Pod sounds like an emergency food to escape a greedy craving. I like that concept. yum! thanks for sharing! looks delectable! Love your site. These choco-pods look amazing, and I love the idea of chile and pepper in chocolate. I'm one of those people who saw the movie Chocolat and spent hours online looking for recipes to make "traditional" Mayan cocoa with chile pepper. So this, individual packets of exotic flavored chocolates? SOLD! I'm absolutely going to Whole Foods to search for these, thanks!